Recently a reader wanted to know how to go about choosing the right day care for her baby. She also wanted to know how my baby adjusted and how my experience was with the day cares in general. 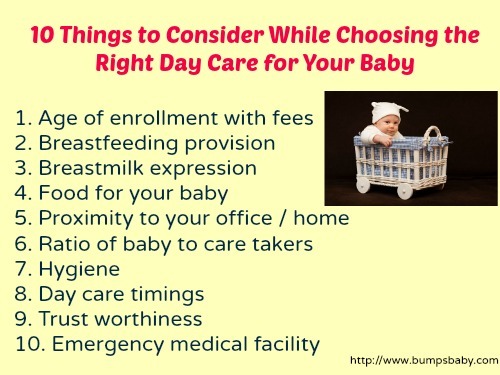 Hence thought of compiling a post on the 10 things you should know about choosing the right day care for your baby in the form of question and answers. What’s the age from which the enrollment to the day care starts? It entirely depends up on the day care centres. I have seen certain day cares accepting admissions of even 3 month old babies. Other day care centres stresses the age limit as 6 months and above . My daughter is breastfed and I need to resume my job. Can I do so with a day care? Yes of course. My daughter was exclusively breastfed till 6 months though I was working. I used to express milk in bottles so that it could be fed to my daughter. At lunch break, I used to go to the day care and feed her too. If my daughter was asleep, I used to express milk and give it to the lady to store it in the refrigerator. Which Breast pump did you use and was it useful ? I used Medela Mini electric breast pump and I felt as if it was God-sent to me. I couldn’t imagine those days of mine without it. You can read the review of Medela Mini electric Breast pump here. How about food in the day care ? You have to check with the daycare authorities whether they would be providing food if your baby is above 6 months. If yes, check with them the quality of food and ask for the time-table / food charts followed by them on a daily basis. We were given sampling of the food provided by Anshika’s first daycare. You can ask your daycare too to ensure the quality of food . Certain day cares do not provide food . In that case you might to have prepare food and pack it in boxes for your baby just like I did for Anshika’s second daycare. How can I choose the right daycare for my baby ? These are the things that you should consider while choosing the right daycare for your baby. Proximity to your office / home, food, ratio of baby to caretakers, hygiene, trust worthiness , timings , fees, medical emergency facility and provision for breastfeeding at breaks (if you require). Will my baby adjust to the daycare ? Depends upon how the baby gets adjusted to the new environment. You can try the settling period for a week just like we did. On the first day of the week, Anshika was left in the daycare centre for 2 hours , then gradually increasing the number of hours to see if she is adjusting to the daycare atmosphere. 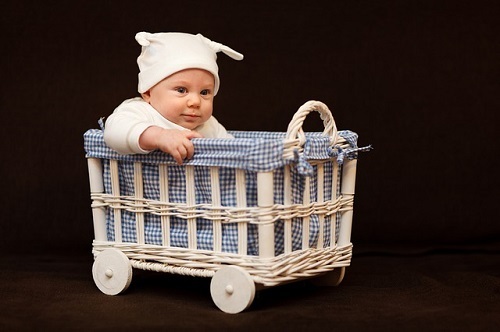 What all should I pack in the daycare bag for my baby ? What are the facilities a daycare offer ? Provision for breastfeeding and expressing breast milk were the ones I required. I have heard that certain day cares provide real-time monitoring videos of babies to the parents. I don’t have any experience on this though. Certain day cares have care takers to pick your baby/ kid from school to the daycare/home and vice versa. You can check on that front too. What are the must ask questions to the care taker of my baby ? These are the must ask questions to your child’s care taker on an everyday basis. For how long did your baby sleep ? How many wet diapers and potty ? How about the food habits followed by him/ her on that day? Is there replenishment of diapers/baby clothes/towels/ wipes/creams required the next day ? 10. Would my baby be diapered all the time in the day cares ? Again it depends upon the daycare . Anshika’s first daycare had all babies diapered for the entire duration while her second daycare lady didn’t allow to put on diapers for Anshika at all. You have to ask the daycare authorities about it . Very informative post abut baby care. I really enjoyed the post. curry on your writing hope we will get more post about baby care.